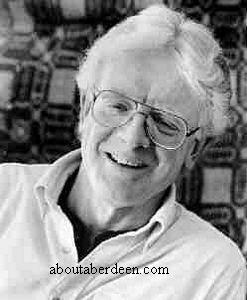 Scots Singer Norman Kennedy was born in Aberdeen and lived in a two bedroomed flat in King Street and was a popular performer during the 1960s. He worked on the family farm where he learnt traditional Scottish farming techniques using old tools. During this hard work the family and their workers would sing traditional Scots songs and narrate traditional Scottish tales. In 1966 he moved to the USA and he now lives in America though still comes back to Scotland to perform and give concerts throughout the Country and back in his home County of Aberdeenshire. In addition to being an accomplished singer, Norman Kennedy keeps alive the traditional weaving ways and dyes his own wool. He loves to weave whilst singing to his audience. Norman Kennedy continued his love of weaving in the USA where he served as master weaver at the living history museum at Colonial Williamsburg for six years. Norman Kennedy founded the Marshfield School of Weaving in Marshfield, Vermont in 1976. He taught there until he closed it in 1995. Norman Kennedy has recorded many albums, as an individual artist and with other singers and musicians. His music centres around traditional songs, ballad music and folk songs. He still performs live throughout the United States, singing traditional songs, telling the Scottish stories he learnt as a youngster and demonstrating traditional weaving techniques. In June 2003 Norman Kennedy was awarded the National Heritage Fellowship by the National Endowment for the Arts in the USA. It was presented to him by United States President George W Bush at The Library of Congress. It was awarded in recognition of his lifetime of dedication to artistic tradition. Buy these CDs at discounted prices with free delivery available . On the 22 November 2006 Norman Kennedy returned to Aberdeen to present a hand-woven suit to the curators of Aberdeen Art Gallery for the costume collection. The hand-woven suit is of historical importance to Scotland's weaving heritage and is a fine example of Norman�s spinning and weaving. The suit was made by Norman back in the 1960s when he was preparing to move to the United States. Once in America Norman Kennedy found the suit far too warm for the sunnier climate and only wore it twice. The weight of the thick green tweed would have been ideal against the harsh Grampian wind and rain but was ill suited for the warmer New England, US weather in July. The first time Norman Kennedy wore the green tweed hand wove suit was for a singing performance in the USA in 1965. The only other time he wore it was to meet Maria Von Trapp in the mountains of Vermont. They enjoyed a meal of fried chicken and apple strudel. Norman Kennedy was in Aberdeenshire upon the invitation of the Grampian Guild of Weavers, Spinners and Dyers to perform a rare Waulking of the Cloth on Saturday 25 November 2006 in Lochter, Oldmeldrum. In the evening he performed a concert with renowned folk singer Margaret Bennett. They sang traditional songs and told stories of old, to encourage the weavers' beating and pulling as they finish off a specially prepared tweed.